Sherwood Forest woodlands (Sunnyside wood, Birklands) © Copyright Tom Courtney and licensed for reuse under this Creative Commons Licence. In the public imagination Sherwood Forest will forever be a landscape of sturdy oaks trees and dense greenwood inhabited by Robin Hood and his Merry Men. In reality, however, the term ‘forest’ was a legal one that referred to land outside (foris) the common law and subject to a special law introduced by the Normans to protect the venison (beasts of the chase such as deer and wild boar) and vert (the vegetation the animals lived on). Sherwood Forest was never exclusively dense woodland and was instead a “heathland forest,” a mix of sandy heaths, woods, cultivated land and settlements. The Normans’ love of hunting had by 1086 led to “a rapid and violent extension of forest land” with 21 royal forests established: the most violent example was the creation of the New Forest in Hampshire where a number of villages were destroyed and the population displaced. They reached their greatest extent under Henry II (1154-89), “an efficient and ruthless man,” who restored the effective administration of forest laws after the chaos of Stephen’s reign (1135-54). Forest law in the 12th century was harshly enforced (e.g., punishment by death or mutilation for trespass to the venison) and “these severe and irksome laws caused great resentment among barons and commoners alike.” After considerable pressure from the barons the Charter of the Forest was issued in 1217 which repealed the cruel forest laws and prepared the ground for fixing the forest boundaries back to those that applied in the early years of Henry II. The origins of Sherwood Forest are obscure. It first appears in the 12th century as “the forest of Nottingham” but the earliest reference to “the Forest of Sherwood” was in 1177. The name Sherwood is a corruption of “Shirewood,” from the Anglo-Saxon Scirwuda. The documentary record suggests that much of Nottinghamshire north and west of the River Trent was under forest law in the 12th and early 13th centuries. To the east of Sherwood was the Forest of the Clay, which continued to be referred to separately up to the early 1220s. However, after a decade of disputes between Nottinghamshire’s major landowners and the crown over which areas should be included in the forest much of this territory was disafforested in 1227. Map of Sherwood Forest (click on the image to view a larger version of the map). The forest area defined by these boundaries covered approximately 90,000 acres (about 17% of the county) of land composed of poor, acid soils overlying the Sherwood sandstones which run north-south along the western side of the county. The boundary was defined to a large extent by rivers: the Trent on the south, Doverbeck to the south-east, the Leen to the south-west and the Meden on the north. The poverty of the soils created a landscape with substantial tracts of open sandy heath, interspersed with woodland, a handful of deer parks in addition to almost fifty settlements, the town of Mansfield and the borough of Nottingham. However, although Nottingham lay within the boundaries of Sherwood Forest it appears to have been exempt from forest law. The Crown owned large areas within the Forest, including Clipstone Park, Bestwood Park, Nottingham Castle and Park, Birkland and Bilhaugh. The large royal park at Clipstone, created by Henry II in the 1170s, was the focus of much of the hunting activity in Sherwood. 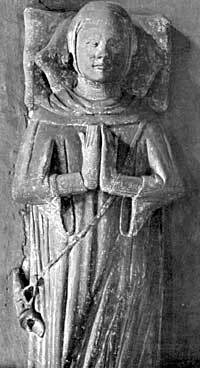 Clipstone was visited by Richard I in 1194 and was popular with John throughout his reign (1199-1216). The forests provided the Crown with important sources of income. Apart from hunting and wood rents from landowners in the forests, there were grants of pannage of pigs and herbage for domestic animals. Forest courts also brought in revenue from fines and confiscations. Venison was supplied to the royal table and deer were often granted as gifts to favoured nobles to stock their parks: for example, in 1277 two live bucks and ten does were supplied to Richard Foliot to stock his park at Grimston. Sherwood Forester-of-Fee at Skegby church. Administrating Forest Law required a sizeable administrative machine, consisting of officials and courts to enforce it. Forest Law developed in parallel to, but separately from, the Common Law and was inevitably prone to abuse by forest officials. For example, in 1286, Robert de Everingham, Keeper of Sherwood Forest, was imprisoned for trespass of venison. At the top of the hierarchy of forest officials were the justices of the forest for the forests north of and south of the Trent. Beneath the justices were the wardens (also known as keepers) who were usually in charge of a single forest. Wardens were either appointed by letters patents or were hereditary. Verderers came below the wardens but were directly responsible to the king, not to the wardens, and were elected in the county court. Verderers had to be land owners and were usually knights or holders of large estates. Most forests had four verderers but Sherwood had six. Their main role was to attend the forest courts. Foresters came next in the administrative hierarchy and were appointed by the wardens upon whom they depended for their salaries. Foresters-in-fee held his office by heredity. Woodwards were private foresters, appointed by landowners to protect their woods within the forest area. They also had a responsibility to protect the king’s venison. In addition to the attachment courts and the eyre there was the swanimote, a meeting of the foresters to make arrangements regarding pasture and to receive rents and the special inquisition held when a deer was found dead or wounded or for forest trespass. An important feature of forest administration was the production of written perambulations of the forest’s outer boundaries. The boundaries were marked by merepoints (waymarkers), which were used by forest officials during the perambulation process. 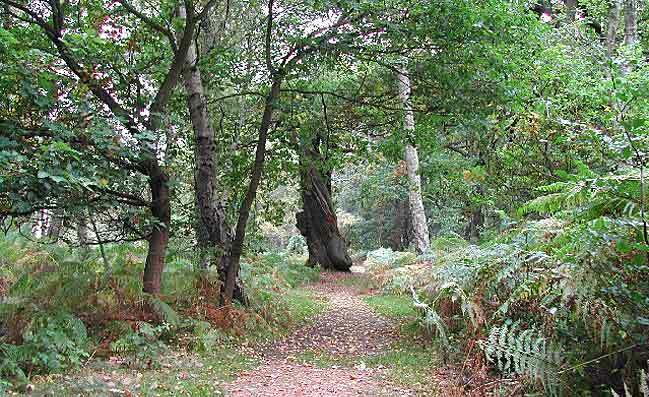 The earliest surviving perambulation of Sherwood Forest dates from 1218; the last one was made in 1662. By the early 16th century the forests of England had become a shadow of their former selves and although there was a revival of interest in them by Charles I in the 1630s when he tried to use forest law to supplement royal income the interest was short-lived and the Civil War and resulting Commonwealth led to increasing destruction of woodland cover. This accelerated after 1660 when the royal woods of Sherwood became a major supplier of timber for the navy. The Crown remained the largest landowner in Sherwood Forest in the early 17th century but by the early 18th century substantial tracts of land in the middle and northern parts of the forest were sold off to a handful of nobles who established several extensive estates. In 1683 William, the fourth Earl of Kingston, obtained from Charles II a grant of 442 acres out of the hays of Bilhagh in Sherwood Forest, and 828 acres from the township of Perlethorpe and Thoresby, for the formation of Thoresby Park. Several years later in 1709 licence to empark 4,000 acres of forest at Clumber was granted by Queen Anne to the Duke of Newcastle. The park was demised to the queen for life and reverted to the Duke upon her death. The Duke was expected to maintain the lodges, pay the keepers and provide hay for the deer. The creation of these Dukery estates “not only transferred land out of royal hands, it extinguished forestall rights over them” and the parliamentary enclosure of parishes within the forest during the 18th and 19th centuries completed the process. The landowners turned much of the land into parkland, with ornamental lakes and a large number of plantations. 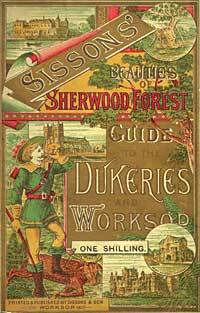 Cover of Sisson's guide to Sherwood Forest and the Dukeries (1888). During the 19th century Sherwood Forest became a tourist attraction, in part the result of the growing popularity of romantic novels set in the middle ages. The ‘Major Oak’ (named after the antiquarian Major Hayman Rooke) was a much-visited feature of the forest. Sherwood Forest in the 20th century has seen the rise and decline of the coal industry with it colliery towns, villages and railways, the growth of the Dukery estates, and the creation of extensive conifer plantations. More recently, however, a long-term project to replace the conifer plantations in the heartland of Sherwood Forest with oak and birch pasture woodland more typical of ancient Sherwood has been completed.